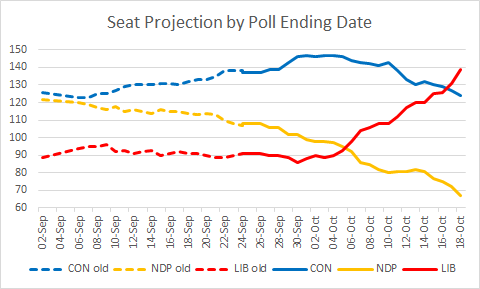 Today's EKOS poll shows a huge bump for the NDP: 3.5 points, even though only 1/3 of the sample was updated from yesterday. The NDP is suddenly back ahead in Québec by 11.8 points and in BC by 4.5 points. Is this bump the start of a new trend? Remember that today's Nanos poll showed no big change for the NDP. 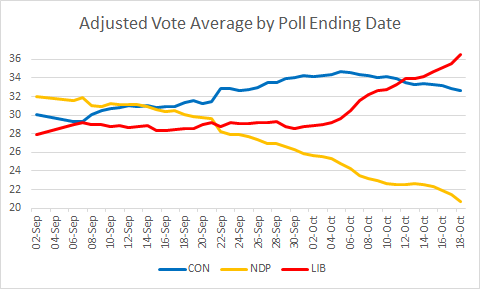 For now, the prudent hypothesis is that this is merely mean reversion, as EKOS has had the NDP lower than most other pollsters. This poll also contains good news for the Liberals, who have a whopping 18.1-point lead in ON. That is almost certainly too large, but does suggest that the 12-point lead seen by other pollsters may be close to the truth. My polling average has the Liberals ahead by 8.8 in Ontario, or 5.5 after the turnout adjustment. This is the first decrease of the campaign for the Bloc. The NDP appears to have leveled off around 80 seats. What are your thoughts on the 905 region ? Do you have an idea on how the area is trending. Doesn't the area have like 12 seats or is it 24 ? Because I thought Ekos said it was 40-40 before the long weekend. I'm wondering because the conservatives are now going around immigrant communities driving up the fear factor about brothels, injection sites etc. Not sure if its having any resonance. They are all untrue but ... that is besides the point as fear sometimes can trump rational reasoning especially when it appears to be closely aligned with one's cultural worldview. I mean, the if all the lead is in Toronto, and while it would help in getting all the Toronto seats, in terms of overall seat counts, I was wondering about the effect on Ontario seat count totals for each party. The only recent 905 breakout we've had is in yesterday's Ipsos, with a sample of 95. FWIW, it was LIB 48, CON 36. My adjusted projection has the 905 at LIB 46, CON 37. In terms of seats, that's 21-7 for the Liberals. The unadjusted projection is 47-35, giving a near sweep in terms of seats: 24-4. 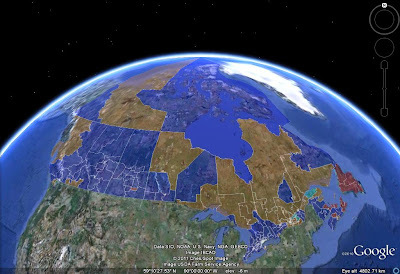 I'd venture that the fight is increasingly outside the 905, in areas that looked unattainable to the Liberals.